*If you want to learn the basic requirements for creating a ticket, read this section first. 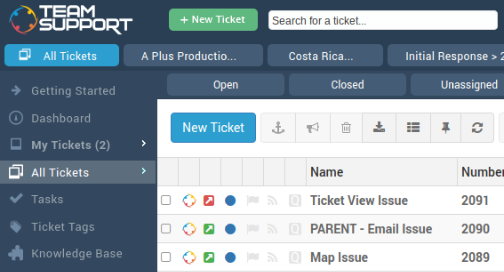 To create a new ticket manually, click on the + New Ticket Button next to the TeamSupport logo. Notice also that there is a New Ticket button at the top of each grid in the My Tickets and All Tickets sections. The following form is displayed. The only required field for this form is Name. Name: Each ticket must have a name/description. This is typically the subject of the ticket. Action Toolbar: TeamSupport gives you lots of tools for enhancing your action description. Description: This is where you type in the ticket description. You can insert links to other tickets, insert KB articles as canned responses, and other edits. Date Started: This field defaults to the current time, although it can be changed to indicate the time work on the ticket started. Hours and Minutes: You can indicate how much time is spent on each action of a ticket. The following describes the available selections on the right hand side of a ticket. Please note that your fields may differ from those described below. Ticket fields can be reordered and/or removed in the Ticket Page Order section. Assigned: Assigns the ticket to a defined TeamSupport user. See the User section on how users are created and defined. Group: Like user assignment, you also have the option to assign a ticket to Groups. Type: Tickets can be classified as any Ticket Type, and can be reclassified at anytime. Status: The Ticket Status defines the current state of the ticket. Severity: The Severity of a ticket helps define what kind of attention is needed. Add Customer: You can associate one, or multiple, customers/contacts to a ticket. Visible: Indicates whether this ticket and the initial action will be visible to customers. Knowledge Base: Checking this box will add the ticket to your Knowledge Base. When checked, an optional “KB Category” pick list will appear. Community: Community is a Forum available on the Customer Hub. Due Date: If you include a Due Date on the ticket, it will be displayed on the right hand side of the ticket and will turn red when past. Ticket Due Dates appear on the Calendar, and can be Reported against. Product (Enterprise edition Only): By defining the products provided by your company within the Products section, you will have the option to select the particular product in question with regards to the ticket. Reported/Resolved Ver. (Enterprise edition only): A powerful option in TeamSupport is the ability to track Reported and Resolved versions on each ticket. Add Inventory: (Enterprise Only) You can indicate if an item from your inventory was related to the ticket. Add Tags: Tagging tickets with keywords allows you to further classify and organize your tickets. Add Reminders: Reminders help you follow up on important issues regarding tickets. Add Ticket: Allows you to create a “Parent”, “Child”, or “Related” relationship. Add to Queue: Allows each person on your team to set aside certain tickets from the pack for easier management and prioritization. Subscribe Users: Subscribing enables team members to get email updates on a ticket’s progress without the need to look up a ticket.